As the manufacturing process has evolved, so have the skills that workers need to get the job done. These manufacturing companies know how to find manufacturing talent—and keep them happy and engaged. As a manufacturer, having the right people in place can make the difference for your products. Yet finding top talent can be challenging, especially since you’re not the only employer trying to recruit manufacturing workers. So how do you stand out and win the race for the best? “In today’s market, it’s not only about what the candidate can contribute to the company but what can the company contributes to the candidate,” says Brian Kingston, HR director at MC Assembly in Melbourne, Florida. 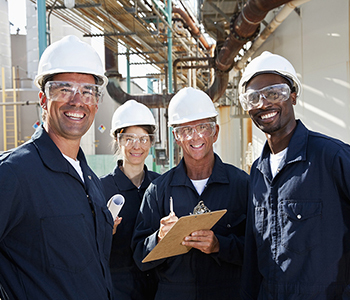 Here are some expert tips for how to recruit and retain the best manufacturing employees. “In a hyper-competitive job market like the one we’re in today, recruiting via online career sites like Monster and building a solid online employment brand is critical. Taking the time to build out our company profiles and job descriptions so that candidates can get a sense of our culture, values and an overview of our business is more important than ever." “On the first day we start new hires with a safety and quality training. This allows employees to learn safety tips, who to call, where to go and how to work in a safe way. It also stresses the most important aspect to our business: quality as our No. 1 priority. This happens well before an employee walks onto the production floor." Are you ready to hire great manufacturing workers to help grow your company? That talent may be hard to find in today’s tight labor market. We’re here to help. Sign up for exclusive Monster Hiring advice and we’ll send you the latest information to help you hire the talent you need, from crafting the job description to posting the job in all the right places. We’ll even throw in a special job posting offer to get you moving in the right direction. It’s time to hire the team you need and start manufacturing.